Dozens of people have been injured as more than 130 vehicles were involved in a series of crashes in thick fog on the A249 Sheppey crossing in Kent. 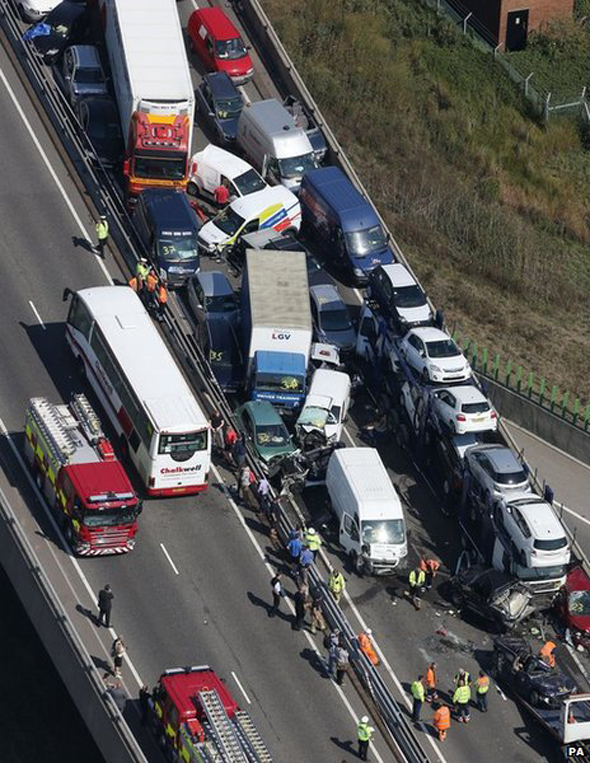 Eight of those hurt in the collisions, which took place at about 07:15 BST, have serious injuries. Ambulance crews said 27 casualties needed hospital treatment and they dealt with 200 people at the scene. The crossing will remain closed for the rest of the day and rush-hour drivers have been warned of delays. 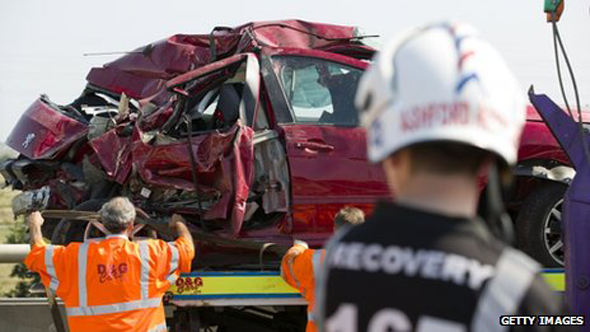 Firefighters said they had freed five people from their vehicles on the southbound carriageway. One witness said visibility had been very poor at the time of the crash but drivers were approaching the crossing with no lights. 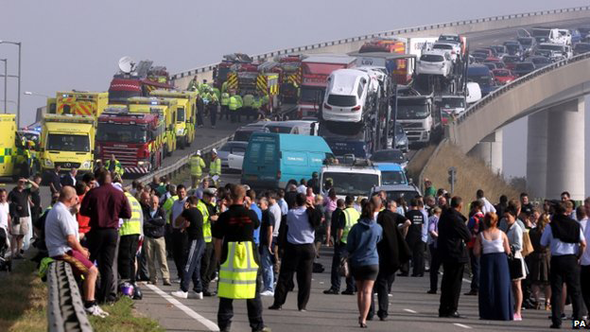 Others at the scene described a mass of tangled cars, lorries, and a car transporter. Some reports said the crash went on for 10 minutes as cars continuously collided with each other. South East Coast Ambulance Service (Secamb) said eight people were seriously injured with a further 27 requiring hospital treatment. A Secamb spokesman said a further 200 people were either treated for minor injuries or given advice should symptoms develop later. The injured people were taken to six different hospitals in Medway, Ashford, Margate, Maidstone, Canterbury and London. Medway Maritime Hospital declared a major incident and cancelled all its routine planned surgery, to help deal with the incident. A spokesman said the hospital remained on standby and its emergency department was open. 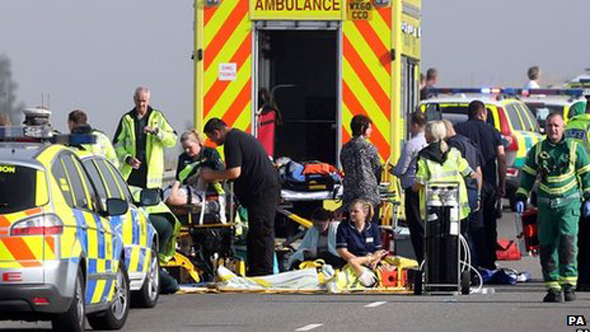 Ch Insp Andy Reeves said the crash was over a "protracted area"
Secamb said the first ambulances left the crash scene at 08:50 BST because much of the triage and early treatment was carried out at the scene. Patients started arriving in hospitals shortly after with Medway admitting its first casualty at 09:45 BST. The national speed limit applies to the dual carriageway crossing, with cars able to travel up to at 70mph, the Highways Agency said. Driver Martin Stammers said the scene was "horrendous" and described seeing cars under lorries and people lying on the floor. He said visibility was about 10 to 20 yards when he approached the bridge and saw five cars smashed into each other with one across the outside lane. He managed to squeeze through a gap between that car and the central reservation. "For 10 minutes afterwards, all we could hear was screeching, cars thudding into each other, lorries crashing," he added. He said he and his son ran to warn other drivers and warn cars to slow down. "Later, a woman came up to us sobbing saying, 'thank you, thank you, you saved my life'," he said. Jaime Emmett, a 19-year-old student who was driving through the fog, said she managed to stop in time but a van collided with her car, and she then hit a car in front. She said the fog was so thick she could only see a few cars ahead but added: "All I could hear was the cars smashing in front of each other and I could not know how far ahead the accident was." Later she said she could see "smashed cars everywhere", a lorry that had crashed into the central reservation and ambulance crews helping injured people with one team carrying a man in a stretcher. Cliff Montgomery, 53, who was driving from his home on the Isle of Sheppey to Gillingham, said he was trapped in a group of vehicles with a pile-up in front of him and another one behind. "I was in the outside lane when vehicles in front of me braked and cars were crashing," he said. "There was another pile-up behind the group of cars I was travelling in. All I could do was brake, stop and await further instructions." He said it was very foggy and in some places he could only see 30ft in front of him. Mr Montgomery added: "When you see the state of vehicles being brought off the bridge on transporters, you have to think it's very lucky that no one was killed." Ch Insp Andy Reeves said the crash was over a "protracted area" with undamaged vehicles between others which had collided. As far as the eye could see it was car after crashed car. of some of the crashes. into the back of them. For many this incident was a terrifying experience. When asked if the fog had caused the crash, Mr Reeves said it was "too early" to give a cause but added the "weather will be a factor". "It was... very hazardous. It was described to me as a very thick fog and it was certainly low visibility at the time." He said he expected the crossing to remain closed in both directions for the whole of the working day, including the evening rush hour. The front of the crash happened where traffic was coming off the bridge towards Sittingbourne, and it had then "concertinaed" over the bridge behind it with incidents stretching back to Queenborough, he said. Mr Reeves said there could also be a small number of incidents on the northbound carriageway. Police said if people had to make essential journeys to the island they could use the old Kingsferry Bridge, but should expect long delays. The Highways Agency said the road would remain closed until early evening. Spokesman Dom McLeman said delays on the diversion route had decreased during the day but were expected to increase during the evening rush hour. He said contractors were working with emergency teams to reopen the road as soon as it was safe, but once vehicles had been recovered the contractors would have to assess the road damage and carry out repairs. Sittingbourne and Sheppey MP Gordon Henderson said he had previously had concerns about lighting on the bridge and said he would be asking questions of the authorities about the accident. He added: "Today my concerns must rest solely with the people that have been injured on the bridge." The £100m four-lane crossing, which connects the Isle of Sheppey with mainland Kent, opened in 2006 and is 0.75 miles (1.25km) long and rises to 115ft (35m) at its highest point.